The season 2 premiere of The Walking Dead gets a new title and will no longer be known as “Miles Behind Us” as reported by Zap2it. Earlier this year it was reported that episode 7 would be called “Miles Behind Us”, which happens to follow the paperbacks. The premiere episode will now be referred to as “What Lies Ahead” as a way to accurately reflect where the show is going. 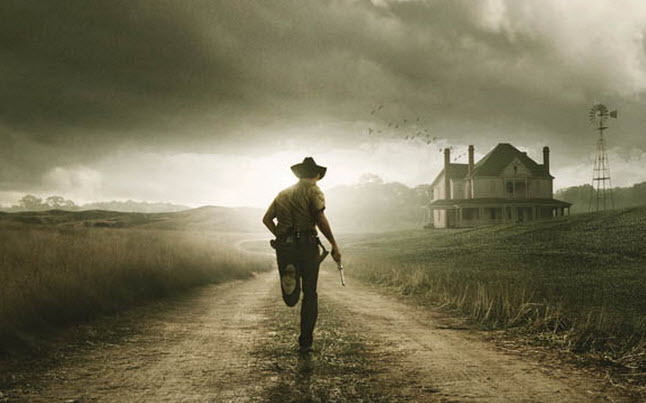 Season 2 will move the characters from the Atlanta metropolitan area to a rural setting, and the city will be left behind. The title was changed in partly to be more reflective of the show and of season 2. The group finds themselves heading out into the rural countryside where we will be introduced to a new setting and new characters. Hershel’s Farm will come into play which many know from the comic book series. You can expect to meet Hershel Greene, Maggie Greene, and Otis. Maggie happens to be the daughter of Hershel, and we are expected to see a relationship between Glenn and her develop. Otis, played by Pruitt Taylor Vince, is the farm hand that helps out around the property. Also, the title for episode 8, or the second episode of season 2, will be called “Bloodletting”. If you look up what “Bloodletting” means, this is what you will find. Bloodletting (or blood-letting) is the withdrawal of often considerable quantities of blood from a patient to cure or prevent illness and disease. This should be a good indicator of what we can expect episode 8 to focus around. AMC often will cleverly title their episodes to either be metaphors, or to simply give a hint of what they will be focusing on. The season 2 premiere of The Walking Dead is only 10 days away!